Top 6 Ways to Enjoy the Outdoors in Princeton! Eclectic boutiques, antique stores, Amish shops and the largest outdoor weekly flea market in Central Wisconsin make Princeton one of the best places to shop in Wisconsin. Visit us for some retail therapy. Princeton Wisconsin is a birders paradise. Every year a number of endangered Whooping Cranes spend their summer in the White River Wildlife Area. The annual Princeton Crane Festival celebrates this wonderful bird with some of the best bird watching in Wisconsin. Bring your camera and binoculars! Nestled on the banks of the mighty Fox River between Lake Puckaway and Green Lake, Princeton, WI is a water lover’s paradise. There are many opportunities to get outdoors and explore. Sometimes the best things in life are old, loved and rescued. Princeton is home to one of the largest flea markets in Wisconsin and many antique shops. Vintage shopping is awaiting you in Princeton, Wisconsin. Princeton, WI is centrally-located in Wisconsin just west of Green Lake. Its location on the Fox River and near the Mecan River makes it a destination for outdoor adventurers. 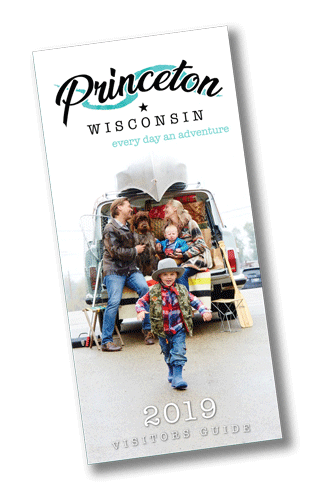 Princeton is home to the largest outdoor flea market in Wisconsin and it's downtown offers small town shopping with some of the finest urban flair goods in the state. Copyright © 2019 Princeton, Wisconsin Chamber of Commerce | Worlds Greatest Flea Market. All rights reserved.